6X10.5 Magnets: Thanks for Making Them Your Branding Companion and Here’s What You Don’t Know About Them! People may miss on business cards or other small promotional items gifted to them by marketers or they can pretend ignorance about never receiving them, but they cannot do it with these customized magnets. Perhaps its large rectangular shape speaks in its favor and people would be happier to retain full color promotional magnet over their refrigerator doors or car doors. People would proudly discuss it with their family, friends, and colleagues, too. 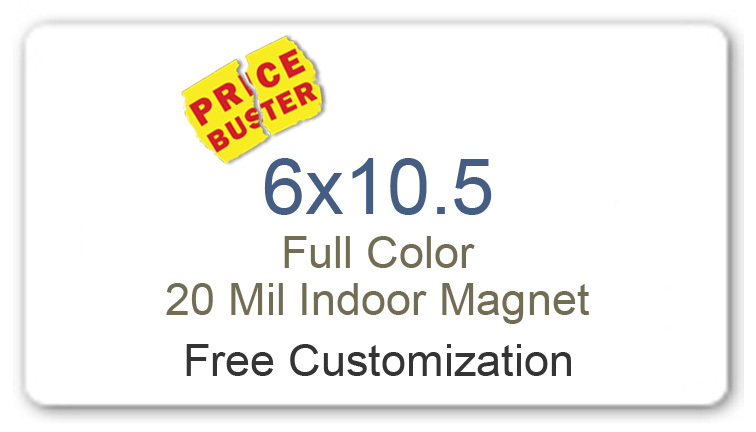 Custom magnets 6×10.5 help to position your business at easy-to-find places. Who would like to keep large and full color magnets out of sight? Whoever receives it would definitely stick it over their refrigerator doors, cupboards or other visible places within the home. They would be happier to retain it as long as they can, which means your brand information is set to receive quality impressions every day. When magnet advertising was in infantry stages, marketers usually had to resort to smaller stock sizes, but today they can find these personalized magnets in typical stock sizes such as 20 MIL, 25 MIL and 30 MIL. Usually the 2o MIL and 25 MIL ones are employed for indoor advertising over refrigerator doors or working cabinets. 30 MIL magnets are UV safe and used for buying attention over car doors or vehicles. Most online stores that stock these custom magnets offer benefits of best buy pricing on bulk purchases. Also, as you might have understood that 6×10.5 magnets are offered at made in USA stores, which means you can save on online design proof, art setup and shipping. Being made of lightweight and high quality material, you can easily carry around customized magnets during tradeshows, or other marketing events. Marketers need not worry about downsizing their information because 6×10.5 is a large dimension for positioning their brand information. In addition, they can avail benefits of free full color printing offered by online magnet stores. They can employ these customized magnets as sales flyers, postcard mailers, menu magnets, calendar magnets, etc. Again 6×10.5 magnets are larger and people cannot miss them over refrigerator doors or car doors. It is sure that onlookers would take a moment to pause and read the contents if they can. This way your brand information is shared easily with the community. There is a lot more to explore over these customized 6×10.5 magnets, only you need to tax your brain and polish your creativity.